The Seward Lady Saints are 5-0 after beating Fort Carson 93-62 Saturday night in the Green House. 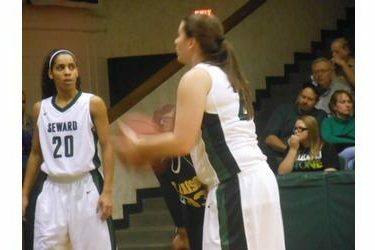 Seward handled a team who had wins over Western Nebraska, Colby, North Platte, and Eastern Wyoming and lost the #3 Hutchinson by seven Friday. Four Lady Saints scored in double figures in the win. Korina Chapman led Seward with 24 points and seven rebounds while Alana Simon had 16 points and seven rebounds, Fabiana Monte added 16 points and six rebounds. Shanise Brooks had 14 points and six rebounds. Seward is 5-0 and the Lady Lions are 4-2. The Lady Saints play at Hutchinson Friday and Saturday at 1:30. SC plays the Central Methodist JV Friday and San Jacinto Saturday. Saturday’s game will air on 1270 and kscbnews.net.